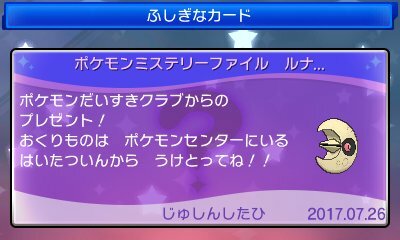 As a concept introduced within the Pokémon Global Link in Pokémon Black & White and continuation in Generation VI, Pokémon Sun & Moon continues the a new method of getting events, the serial code. 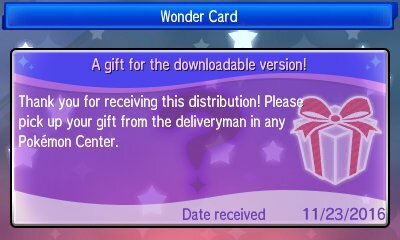 Here, you get given a unique serial code within certain events or releases which is to be entered on Mystery Gift. When you enter the Serial Code, you're connected to the Internet to download the event. The serial code will then no longer work if it's a one-time use code. 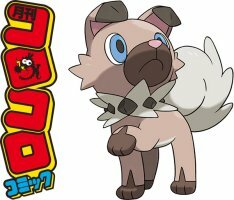 If you buy Pokémon Sun & Moon on the Nintendo 3DS eShop in Japan or EUrope, you will discover a special serial code for 10 Quick Balls. This is only for people who purchase the game on the eShop in the first week..
Japan: December 14th 2016 - ?? 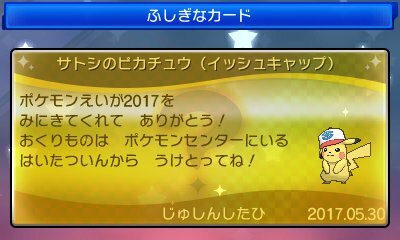 In the special edition Pokémon Sun *& Moon Guidebook in Japan, when you buy both the guidebook and Pokédex book in a bundle, you will get a special code that will give you a Gold Bottle Cap. 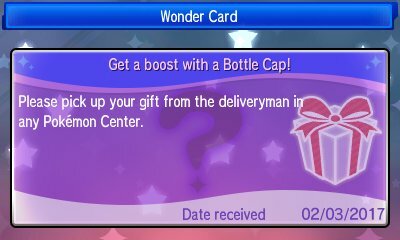 To tie in with the release of the Sun & Moon TCG set, a special distribution of a Bottle Cap was running in Europe through February with the code expiring on May 13th 2017. In the UK, this code is given at all GAME stores. In Denmark, it is being given in Gamestop. In Germany, it is being given through the Nintendo Zone in Gamestop from February 10th. In Canada, the Bottle Cap codes can be obtained through EB Games while in Spain it will be available at GAME through the Nintendo Zone until March 12th 2017. 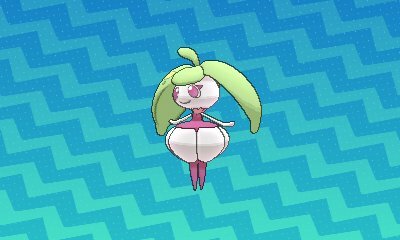 In Italy you can get codes at Gamestop until March 5th 2017. In France it can be obtained from today to March 12th in Micromania stores. It has also begun at GamePlanet in Mexico. If you participated in the Trade Pokémon at the GTS Global Mission and made 5 trades withi nt, then as a special gift for participation, you can redeem a code for 5 Rare Candy & 1 Friend Ball from the Global Link website. For all players who played 3 or more battles in the 2017 International Challenge February online competition, a special code was added to the Pokémon Global Link to obtain a code for Mawilite and Beedrillite. A shared serial code for all other players is planned for April 2017. As part of a continued campaign to distribute Mega Stones, the Mewtwonite X and Mewtwonite Y Mega Stones were distributed globally using the Serial Code: M2DESCENT. 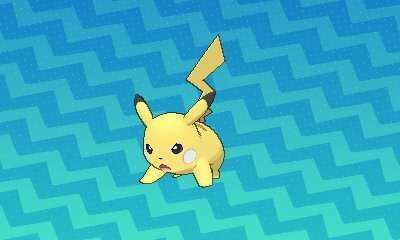 Following 6 years since the tragic earthquake in Sendai, as part of the annual Pokémon with You charity drive, when you donate 500¥, you will receive a Serial Code for a Pikachu with the Egg Move Bestow and the Event Move Hold Hands. In early 2017, the CoroCoro magazine ran a campaign for which Pokémon is the best. 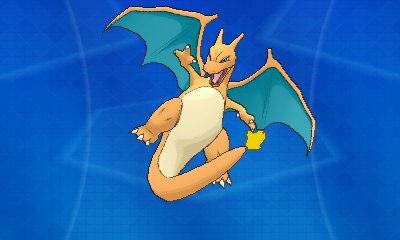 The winner of that campaign is Charizard and from that, in the April 2017 issue of CoroCoro, a special Serial Code is given to obtain the Charizard. 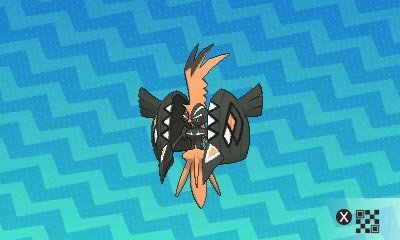 As part of a Shiny Tapu Koko campaign covering merchandise, the TCG and the games, a distribution of a Shiny Tapu Koko was given in many stores in Japan such as 7-11, Pokémon Centers, Yodobashi Camera, Aeon, Amazon and Rakuten. 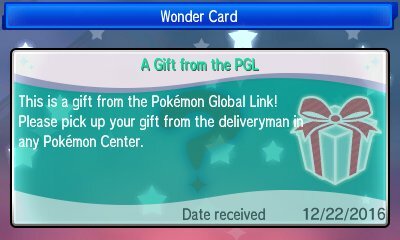 For all players who played 3 or more battles in the Kanto x Alola Regional Rumble online competition, a special code was added to the Pokémon Global Link to obtain a code for Steelixite & Pidgeotite. A shared serial code for all other players is planned for 2017. As part of a continued campaign to distribute Mega Stones, the Mawilite, Medichamite, Audinite & Beedrillite Mega Stones were distributed globally using the Serial Code: INTIMIDATE. To commemorate the release of the movie, Pokémon! I Choose You!, when you prebooked tickets you got a code for a special Pikachu. This Pikachu has one of Ash's hats, depending on when you obtained it. It also came with the Pikashunium Z Z-Crystal. 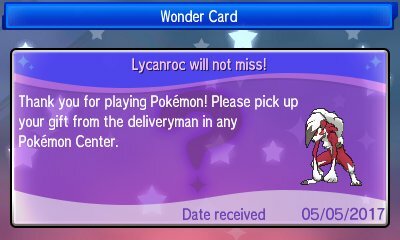 To coincide with the release of the Guardians Rising TCG set, the long rumoured Lycanroc event has finally been announced. In the UK, it will be distributed at GAME from May 5th to May 31st. In France it will be distributed at Micromania from May 13th to June 12th. In Spain, it will be distributed in GAME from May 5th 2017. In Italy it will be given at Gamestop from May 5th to May 31st. 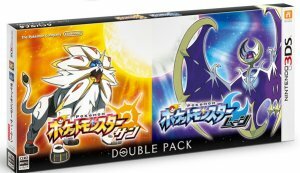 In Germany it will be given at Gamestop from May 5th to May 31st. As part of a continued campaign to distribute Mega Stones, the Pidgeotite, Steelixite, Heracronite & Houndoominite Mega Stones were distributed globally using the Serial Code: AZUL. 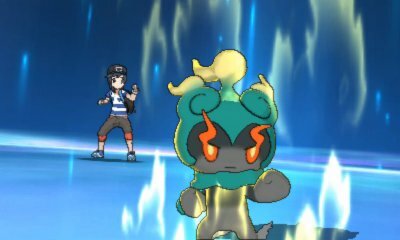 For all players who played 3 or more battles in the 2017 International Challenge May or Japan Championships 2017 online competitions, a special code was added to the Pokémon Global Link to obtain a code for Sceptilite, Blazikenite & Swampertite. 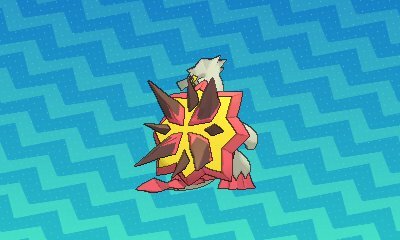 For all players who played 3 or more battles in the 2017 International Challenge May online competitions, a special code was added to the Pokémon Global Link to obtain a code for Tyranitarite, Manectite, Abomasite. As part of a continued campaign to distribute Mega Stones, the Sceptilite, Blazikenite, Swampertite, Banettite & Cameruptite Mega Stones were distributed globally using the Serial Code: MATSUBUSA. 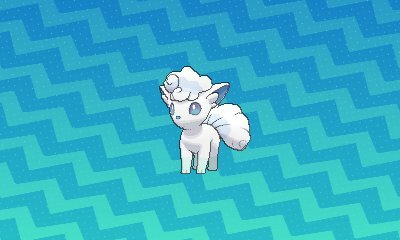 As part of a campaign to promote the Pokémon Sun & Moon TV show, a special distribution was held in Pokémon Centers where you could get a code to download Mallow's Steenee, Kiawe's Turtonator and Lillie's Vulpix. As part of a campaign to promote the 20th movie, Pokémon! 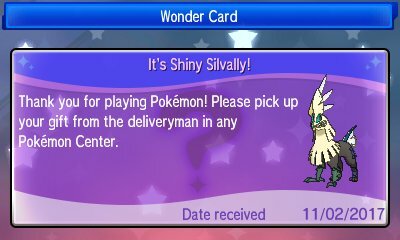 I Choose You, players could participate in a Stamp Rally at 7-11 stores. 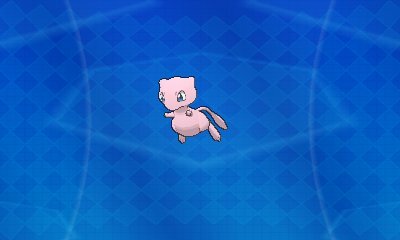 If players got 2 stamps, they could claim a serial code to download the Mythical Pokémon, Mew. As part of a campaign to promote the 20th movie, Pokémon! 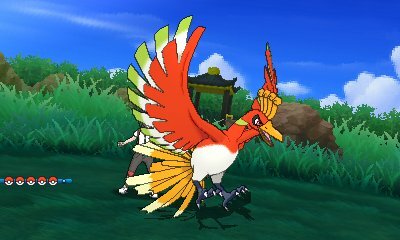 I Choose You, the Japanese magazine CoroCoro provided a serial code to download the Legendary Pokémon Ho-Oh in their August 2017 issue, released on July 15th 2017. As part of a continued campaign to distribute Mega Stones, the Tyranitarite, Abomasite, Manectite & Aggronite Mega Stones were distributed globally using the Serial Code: SABLEVOLANT. As part of a campaign to promote the 20th movie, Pokémon! 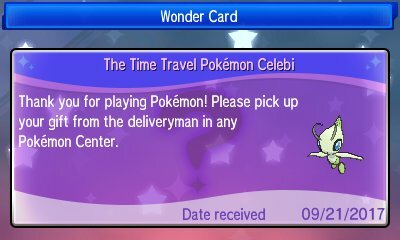 I Choose You, players could participate in a Stamp Rally at 7-11 stores. 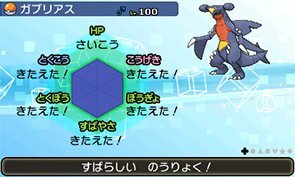 If players got 2 stamps, they could claim a serial code to download one of three Pokémon: Ash's Charizard, Makoto's Piplup or Soji's Lucario. As part of a continued campaign to distribute Mega Stones, the Gardevoirite, Galladite, Lopunnite & DianciteMega Stones were distributed globally using the Serial Code: POYONG. 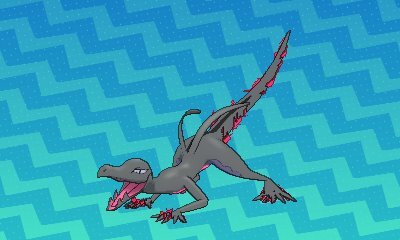 As part of a campaign to promote the TCG set, Burning Shadows, a special distribution for Salazzle was brought to various retailers. In North America, it was in Gamestop.